After we'd read reports it might be his final year on the commentary team in Australia we wanted to show him how much we've loved listening to his commentary over the years so we decided to emulate a little bit of Richie style with the Cream, Bone, White, Off-white, Ivory & Beige jackets. The evolution of the microphone. As the numbers increased our craft skills have improved to produce a fairly handy oversized commentary microphone. 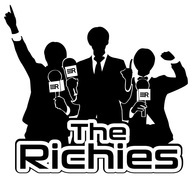 Importantly all Richies must speak into the microphone throughout the day. Even though he is adored worldwide the SCG is Richies cricketing home. Being a proud NSW player, his home ground is the most fitting location for our annual tribute. Day 2 is Richie Day (at least to us). The SCG test is known for so many great things. In the modern day it is the ‘New Years’ test (generally starting on the 2nd or 3rd Jan). Day 1 is a great day for any test, especially at the SCG as the teams vie for early advantages. Day 3 has become Jane McGrath Day and it’s great to see the SCG awash with Pink. We are impressed with the amazing work of the McGrath Foundation and want to support their effort. Day 2 however is Richie Day. Join us in our push to have Day 2 of the SCG test become ‘Richie Day’. Wear cream and celebrate the great cricketing icon.